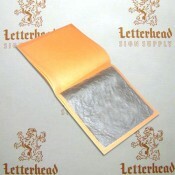 Silver Leaf, buy .999 percent pure sheets for gilding. 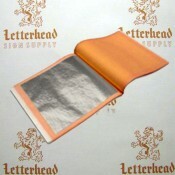 We sell Pure silver leaf attached to paper known as Patent Silver Leaf. Silver Leaf is also available loose in a book. Books of Silver Leaf contain 25 sheets and Packs of Silver contain 500 sheets of leaf. Silver will tarnish easily if handled with dirty hands. Gilded silver leaf should be top coated with a clear coat. Silver Leaf is very hard and heavy compared to Palladium leaf which is softer. Softer precious metals receive or are easier when burnishing. Harder precious metal like Silver leaf tend to show more seams where leaf overlaps, so practice. 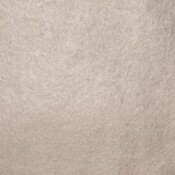 Palladium leaf is the safe choice, but is a little darker in a good way, it has a subtle smoky bronze upon inspection in the right light but can cost as much as pure Gold Leaf and is the easiest-softest to burnish. 6kt white gold is another alternative for light colored silver leaf which is almost brighter in luminous glow than pure silver leaf, 6 karat leaf has a small amount of gold added to the silver to soften the leaf for better burnishing and to give a little bit of tarnish protection. we have silver Aluminum Leaf in single books or packs. Manetti 13.25kt-White Gold-Leaf Patent-Book, Book of 25 Sheets of Gold Leaf, Size - 3-3/8" x 3-3/8", Manetti 13.25kt-White Gold-Leaf Patent-Book each ..
Manetti 20gr-Silver-Leaf Patent-Book is 1-book of Palladium-leaf with contains 25 sheets of 20gr Silver-Leaf, size-3-3/8" x 3-3/8". Manetti ..
Manetti 20gr-Silver-Leaf Surface-Book is 1-book of Silver-leaf with contains 25 sheets of 20gr Silver-Leaf, size-3-3/8" x 3-3/8", Patent/Tra..
Manetti 28gr-Silver-Leaf Patent-Book is 1-book of Palladium-leaf with contains 25 sheets of 28gr Silver-Leaf, size-3-3/8" x 3-3/8". Manetti ..
Manetti 28gr-Silver-Leaf Surface-Book is 1-book of Silver-leaf with contains 25 sheets of 28gr Silver-Leaf, size-3-3/8" x 3-3/8", Patent/Tra..
Silver Leaf Pure Patent Pack 500 sheets Buy .999 Pure Silver Leaf is beaten to 28 grams. .999 Pure Silver Leaf is a larger leaf at 3 ¾” sq..
WB-.999-Pure-Silver Leaf Patent-Book is 1-book of Silver-leaf with contains 25 sheets of Silver-Leaf, size-3-3/8" x 3-3/8", Patent/Transfer-Leaf,..